What do you give to the Mom who has everything for their newborn baby? This is a question I get asked a lot here on Mommies with Style. That and, what do they REALLY need? I have the answer for you guys! 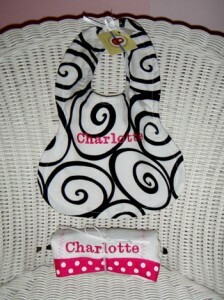 Bibs and burp cloths from BabySophiaGifts.com make the perfect new baby gift for just about anyone. My good friend Jennifer started this business (almost 10 years ago!) when her daughter Sophia, was a baby. 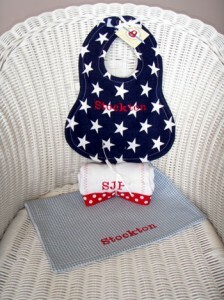 Her Mom now runs the business and she continues to make high-quality, personalized baby gifts that are the perfect choice for any new Mom & baby! What’s not to love about something functional but also cute and personalized? I truly stand behind this product and recommend it all the time to people. You KNOW they’re going to need a burp cloths and bibs and the fun pattern choices and personalization just make this a great gift. BabySophiaGifts.com is offering free shipping on all orders through February 28th!